Practice your alto sight reading skills. Are you playing an instrument? Do you want to improve your sheet music reading skills? 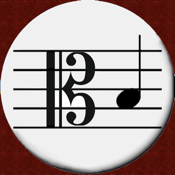 This app is specifically designed for those who would like to practice their alto and tenor clef skills. Whether you're playing the violin, the viola, trombone, oboe, horn, bassoon, cello, or a recorder you'll want to practice your alto and tenor sight reading skills to improve the speed at which you're able to recognize and play the sheet music notes. This app is an ideal tool to improve your skills. Whether you're beginner or an expert musician you'll enjoy practicing your ability with this app. Challenge your friends to beat your score. WE SUPPORT TEACHERS: If you're a music teacher simply send an email to apps@bidbox.com with the subject line "iPad Alto Game" and a short description of where you teach to get a redemption code for this game.